Medicine can seem like a foreign language to most people, and it can be particularly confusing for children. This card game is designed to encourage health professionals to use simple, jargon-free language when talking to child patients about medical conditions, treatments and their health. 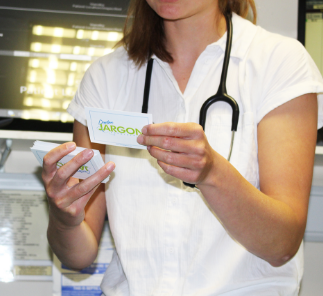 The Dr Jargon card game challenges players to describe and guess medical conditions and treatments against the clock. Players take turns to select a card and describe the medical term on it to their teammates, but don’t mention any of the jargon words listed on your card – you’ll get “busted” by the opposite team and lose a point! Playing Dr Jargon encourages players to think outside the box, and consider alternative ways of describing medical conditions and treatments. It’s a fun way for professionals and students to practise using simple, child friendly language. Players will think creatively and figure out how to explain complex medical terms without relying on complicated jargon! Dr Jargon was created by Focus Games.